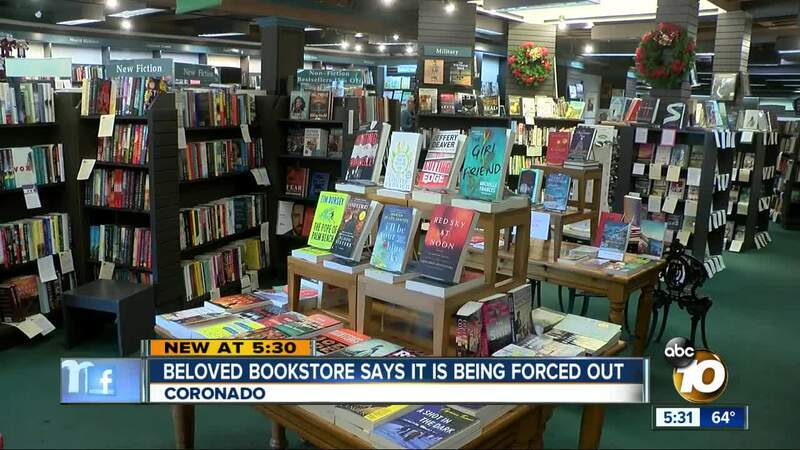 CORONADO, Calif. (KGTV) — An iconic Coronado bookstore says it is being forced out after 27 years at its home on Orange Avenue. Bay Books employees say landlord Kleege Enterprises has found a new tenant for the site and that it has to be out by March. "I'm obsessed with this bookstore," said manager Barbara Chambers. "I don't know what I'm going to do." Building owner Bruce Kleege says this is not the case. He said he believes negotiations with the bookstore are ongoing and that he would like to keep the bookstore, albeit smaller. Last year, Kleege's company bought almost the entire block of buildings on Orange Avenue, the bookstore included, for $22 million. Already, two high-end restaurants and a poke restaurant are on the way, replacing previous tenants. Kleege says the bookstore is paying a fraction of market rent, a gap that needs to narrow, but not close. Meanwhile, bookstore owner Angelica Muller says some of the spaces offered are off the main street, half the space, and double the rent to about $15,000 a month. That's a rate she says an independent bookstore can't afford. Kleege says he is willing to work with the bookstore and wants to continue to negotiate.